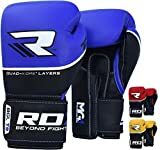 RDX®’s QUAD-KORE T-series boxing gloves are a design apart, perfect for training Muay-Thai kick-boxing on punching bags, pads and sparring. Authentic and highly durable cowhide leather protects the interior, encompassing the entire glove which consists of triple layered padding with integrated shock-absorbent gel throughout knuckle-side. EVA-LUTION FOAM padding around the wrist area delivers overall hand-protection against the harshest of shocks. Quick-EZ Velcro Closure system provides a snug fit whilst supporting the wrists and ensuring fist alignment with the rest of the arm. Strategically placed perforations allow moisture to escape for a fresh palm feeling with reduced odour.